The aftermath of Flav’s 2010 July 4th party. Flavor Flav is a lot of things, particularly a rapper and failed business owner, but one thing he’s not is a good neighbor. At least not according to the other folks in the Finisterre Homeowners Association, which represents the Las Vegas, Nevada neighborhood in which Flav resides. There, he’s more likely to be known as the guy who might be burning down the neighborhood after a terrifying display of explosives. Police confiscated 3 or 4 pallets of fireworks from Flavor Flav’s house, disrupting a fireworks show worth thousands of dollars. 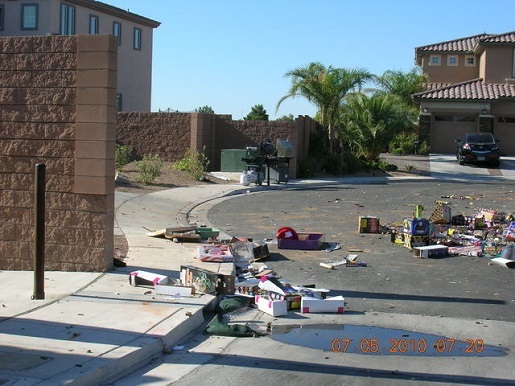 There were at least 100 pounds of fireworks, which required a special disposal unit to show up and take care of all the explosives. Last year, Flav had $8000 worth of fireworks that he took with him when police disrupted his first attempt at a neighborhood fireworks show. In previous years, according to anonymous neighbors, he’d set off fireworks in bunches and use a police scanner to avoid authorities. For his troubles this year, Flav only received two fireworks citations.